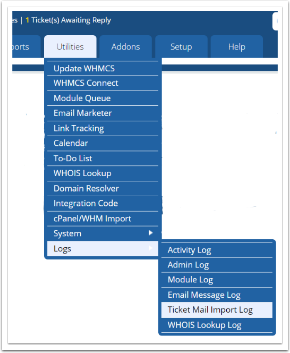 If an email has not been piped into the ticket system, the first reference point is Utilities > Logs > Ticket Mail Import Log. This means you are using an email address assigned to an administrator to send your email. Administrators can only reply to tickets, and not open new ones, hence the Ticket ID not found error message. When testing email piping, you must send an email from an email address that is not assigned to an admin in your WHMCS system. So as to break the cycle WHMCS did not import the email. By default any new tickets from the offending address will be blocked if 10 emails are received from the same address within a 15 minute period, but this can be customised via the Setup > General Settings > Support tab > Ticket Reply EMail Limit setting. Seeing this status means you have selected to only allow registered clients to open tickets in this department. You must untick the Clients Only checkbox in Setup > Support Departments > Edit to allow the public to create tickets. This entry in the log means that an email was received to the department email address, but the subject did not contain a ticket ID, therefore represents a new ticket rather than a reply to an existing one. Due to the Pipe Replies Only option being enabled in the support department configuration, the email was rejected. This email piping status indicates that the email in question was a response to an existing ticket in closed status. The message was not imported due to the presence of the Setup > General Settings > Support tab > Prevent Email Reopening option. The client will have received the "Closed Ticket Bounce Message" email template with instructions to re-open the ticket via the client area or submit a new support ticket if a guest. Information on this feature is detailed in the documentation.